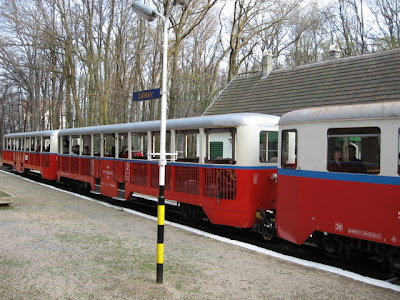 Back in the Communist days, one of Budapest's main attractions for kids was the Children's Railway, which wound its way through the Buda Hills, eventually stopping at the Csillaberc Young Communist Outdoor Camp near Janos hegy. Well, it's still there, still a destination for families out for a Sunday ramble in the woods, such as Buda has them. Thousands of families come out to the Buda hills each weekend for walk, or at least for beer and a few kolbasz while the kids run around. I remember riding this the first time in 1966, and being rather intimidated by all the Communist Young Pioneer kids in red scarves and the brass bands that would meet the train at each station. Those days are long gone. Originally, the train was operated by children, under adult supervision, but they seem to have been more or less replaced by larger and older versions of children. Maybe it attracts more 12 year old conductors in the summer. Maybe not. 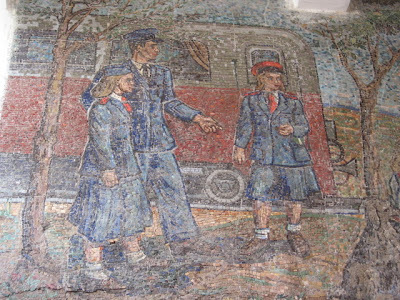 One thing that caught my eye was the old mosaics showing happy young Communists which can be seen on the wall at the Gyermekvasut end station. 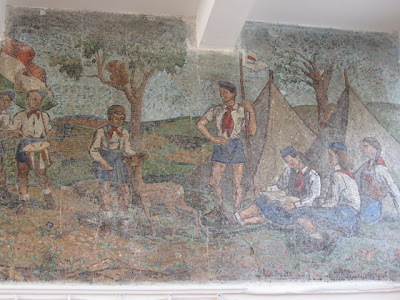 While still sporting their red scarves, the red stars have been carefully erased from the mosaics. 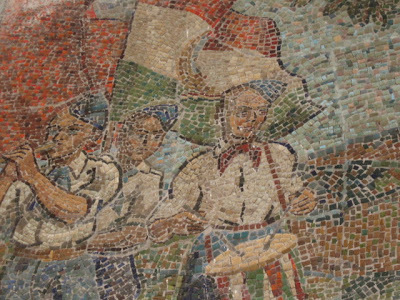 It is becoming very rare to find any visula trace of Hungary's communist past anymore. Most statues and monuments have been banished from the city of Budapest to the Statue Park/Prison outside Budapest, so this was a surprise. 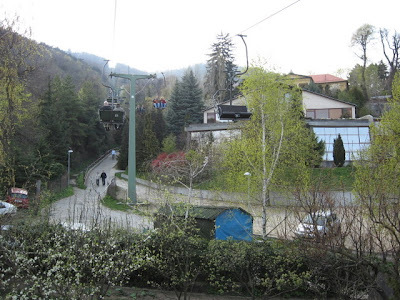 One way to get up to the top of Janos Hegy is to take the chairlift that runs from Normafa staion in Buda (take the 158 bus from Moszkva ter to the end station.) The chairlift is a surreal trip at roof-level altitude through one of the richer parts of Buda. It must be strange to live under the chairlift - strangers passing you window every day, flying over your garden, peeking into your living room. Eventually it plopps you on Janos Hegy, a ten minute hike from the mountaintop lookout tower. 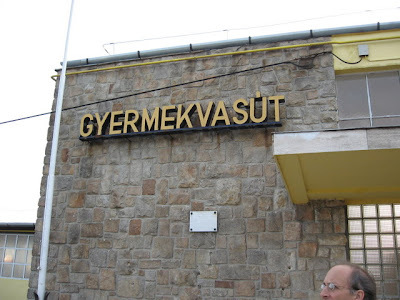 It's also a fifteen minute hike from there to the Janos Hegy stop on the Children's railway. Thank you so much for posting these photos! 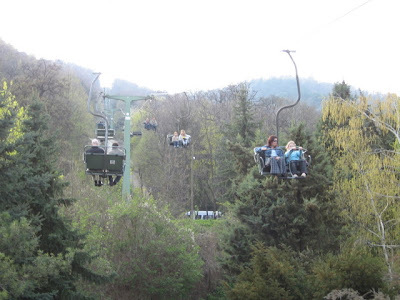 I remember the chairlift - my parents took us on it as a reward for good behaviour during our immigration interview at the Canadian embassy that morning. It was a surreal trip! I went in the summer and there were children working in the trains, inspecting tickets. I'm in the Ukraine. The Frigging Ukraine. .
Cimbaloms Attempt to Take Over My Life, part II.